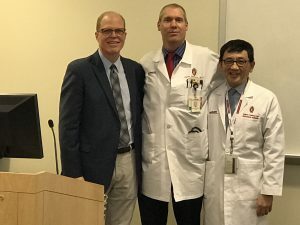 Thanks to a generous gift by faculty member David R. Paolone, MD, the University of Wisconsin Department of Urology hosted its inaugural Dr. David Paolone Lecture Series in Men’s Health Visiting Professor, Kenneth W. Angermeier, MD, FACS. “I wanted to strengthen the Department’s commitment to resident education, especially in my particular area of interest, Men’s Health, and I wanted to show gratitude towards the Department for providing me with a professional and academic environment in which I have been able to grow and succeed as a urologist,” said Dr. Paolone. The two-day lecture series, which took place December 6-7, 2018, included two lectures by Dr. Angermeier – “Posterior Urethral Reconstruction: Trauma and XRT” on Thursday evening and “Management of Rectourethral Fistulas: A Standardized Approach” on Friday morning – as well as a Urology Resident Essay Contest and case presentations. Kenneth Angermeier, MD, FACS has been a Urologist at the Cleveland Clinic Glickman Urological Institute (GUKI) since 1993. He is the director of the Cleveland Clinic Center for Genitourinary Reconstruction, a regional and national referral center for patients with disorders of the lower urinary tract and genitalia including urethral stricture, urethral fistula, urinary incontinence, Peyronie’s disease, erectile dysfunction, and congenital anomalies. He is also Professor at the Cleveland Clinic Lerner College of Medicine of Case Western Reserve University. His primary specialty interest is male lower urinary tract and genital reconstruction and prosthetic surgery, which most commonly includes urethroplasty, urethral fistula repair, implantation of genitourinary prostheses (artificial urinary sphincter, inflatable penile prosthesis, male urethral sling), correction of erectile curvature, and urinary diversion. Dr. Angermeier also has significant surgical expertise in less common conditions such as genital lymphedema and penile/urethral cancer.